With Mother's Day right around the corner, the design team is sharing some gift ideas with you. As you all know, moms like to receive handmade gifts and no one appreciates them quite as much as a mom! So, why not pull out your Bo Bunny collections and put together a sweet and thoughtful gift for your mom this year? The design team has come up with some ideas to inspire you. Jolanda has come up with a couple of adorable little boxes to package fragrances and to also include a little message for mom. These would be perfect for mom to keep and store trinkets in even after Mother's Day. Here is another one with the same sentiment, but a completely different look. Juliana also did a box to hold her gift. She even made a sweet and fashionable ring using a Bo Bunny Button! How terrific is this? The rose on top is so beautiful, I would be tempted to use it as a corsage on Mother's Day! Designer Comment: For more details on how I created this box, please visit my blog 17turtles. 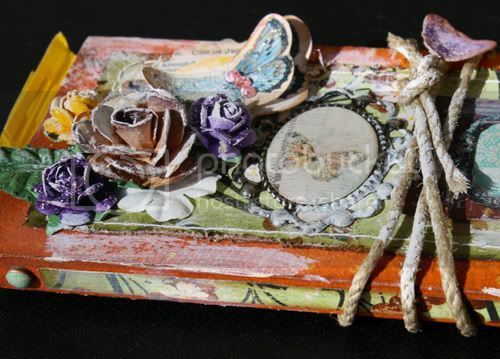 Luzma covered a pretty box, added beautiful details and included as her gift, an invitation to her mom for tea. So pretty! Be sure to take a peek at all the punched and die-cut details. Mahlin came up with this beautiful way to wrap up chocolate for mom. All the details; flowers, cording and paint on this one make it simply beautiful!! With all these wonderful ideas, why not pull out your Bo Bunny Supplies and get to creating! Mom will love what you come up with! Be sure to share it with us on Facebook! We love seeing what you are up to. *sigh* these are ALL GORGEOUS!! Such great ideas!! LOVE them! Beautiful projects! LOVE the rose on Julianna's project. They are all so lovely. Thank you robbie for hosting. Wauw this reallllly is one of my favorite Posts. I love little gift boxes. Ohhh!! such beautiful projects!! just loving every little detail!! Such amazing ideas! Love these! Those boxes are exquisite just great ideas for mom!!! Love those ideas. The boxes are beautiful. I just wish I had the talent to create things like that! Thanks for sharing!